Apple’s latest flagship smartphones, the iPhone 7 and 7 Plus both sport a number of advanced features and services that are specifically designed to cater the special needs of end-users. Accessibility features such as VoiceOver, Zoom, Invert Colors, and flash notifications are just a few of them. These features are especially designed to address the needs of the user. For example, those who are blind or have poor vision can use VoiceOver or Zoom to improve clarity on the display. By the time you turn on your iPhone for the first time, you can quickly enable VoiceOver or Zoom to help you complete the device setup with no hassle despite having vision issues. This post highlights the steps on how to set up, use and manage the iPhone 7 accessibility features. If you’re new to iOS or just made a switch from Android to iPhone device, then this content might be able to help you get started in the iPhone setup and use of the iPhone’s accessibility features mentioned above. Each of the highlighted steps will walk you through the entire process. Scroll to and tap to select Accessibility from the given options. Tap VoiceOver under Vision section. Toggle the VoiceOver switch from OFF to ON. Doing so will enable the feature. You can also change the way VoiceOver works on your device as you would prefer. All you have to do is configure some options from the VoiceOver menu including Use Pitch Change, Verbosity, Speech, Audio, and more. Alternatively, you can turn on VoiceOver by triple-clicking the Home button of your iPhone. Use your three fingers and double-tap the screen. Doing so will enable Zoom. If you wish to increase the level of the Zoom, use three fingers to double-tap and hold and then move your fingers up or down on the screen. Doing so will increase or decrease magnification of the display. How to use and manage Display Accommodations on your iPhone 7? Head over to Settings-> General-> Accessibility-> Display Accommodations. Select Color Filters. Among the available choices are grayscale, red/green for protanopia, green/red for deuteranopia, and blue/yellow for tritanopia. Three examples of color spaces will be shown to assist you in selecting the option that best suits your needs. To find a filter that works best for you, just swipe left or right on the given examples. You can also use Accessibility Shortcut to turn on Color Filters on your iPhone 7. To do so, head over to Settings-> General-> Accessibility-> Accessibility Shortcut. Once you’re done setting up Color Filters, you can quickly turn them on or off by triple-clicking the Home button on your iPhone. How to adjust color intensity on your iPhone 7? If you are not satisfied with the current color intensity on your iPhone, you can adjust the color intensity of any of the Color Filters according to your preferences. To do so, head over to Settings-> General-> Accessibility-> Display Accommodations. Adjust the Intensity by dragging the slider to customize a filter to become more or less intense. How to adjust color tint on your iPhone 7? If by any chance, you are one of those who have color or light sensitivity, changing the Color Tint of your iPhone display can help. Doing so will let you change the hue of the entire display of your iPhone or other iOS device. The iPhone 7 originally comes with iOS 10 that features Typing Feedback among other Accessibility Features offered. With Typing Feedback, you can use your iPhone to give you feedback as you type. It also allows you to use your device to speak text corrections as well as word suggestions. Navigate to Settings-> General-> Accessibility-> Speech-> Typing Feedback. Once you get to this menu, you can scroll to the given options and configure any of them according to your preferences. Among the available options for you to use are character feedback, speak words, speak auto-text and hold to speak predictions. Character Feedback – enable this option if you want to turn on characters to have your iPhone speak the letters as you type. If you want your iPhone to speak the phonetic name of the letter, then turn on Character hints. Speak words – Enabling this option will let you have your iPhone speak a word as you type it. Speak Auto-text – Turning this option on will let you have your iPhone speak auto-corrections and auto-capitalizations as they appear on the display. Hold to Speak Predictions – This option will prompt your iPhone to speak text predictions by touching and holding on a word as you type. AssistiveTouch is one of the many options found under the AssistiveTouch menu. To open this menu, just drag it to any edge of the screen. 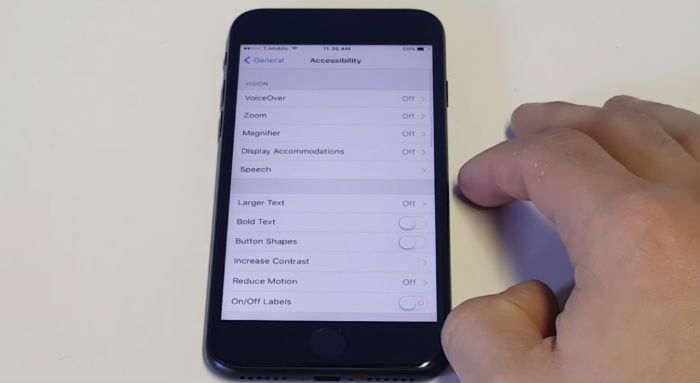 There are different ways for you to enable AssistiveTouch on your iPhone. Settings menu – Navigate to Settings-> General-> Accessibility-> AssistiveTouch. Once you get to this menu, turn on Assistive Touch by tapping on it. Siri – A quicker way to enable AssistiveTouch on your iPhone 7 is through Siri. All you have to do is open Siri on your iPhone and then tell Siri, “Turn on AssistiveTouch.” Just be sure to speak clearly for Siri to understand and execute your commands accordingly. Accessibility Shortcut menu – Another way to turn on AssistiveTouch is by going to Settings-> General-> Accessibility-> Accessibility Shortcut-> and then turn on AssistiveTouch. When Accessibility Shortcut is enabled, you can turn on AssistiveTouch from any screen by a triple-click on the Home button or press the Home button three times. You can also adjust the Triple-click speed by going to Settings-> General-> Accessibility-> Home-click Speed. Open the AssistiveTouch menu through Settings. Touch and hold Lock Screen until you will see the Slide to power message prompt. Access Home screen – Another use of AssistiveTouch on your iPhone is to access your Home screen. To do so, open the AssistiveTouch menu and then tap Home. Open Siri – Meanwhile, you can also use Siri to open the AssistiveTouch menu and tap Siri. Access the Notification Center – If you want to use the AssistiveTouch to access your notifications, open AssistiveTouch menu and then tap Notification Center. When you’ve reached this menu, you will be able to enable or disable Bluetooth, AirPlay, take photos and more. Use 3D Touch – AssistiveTouch can also be used with 3D Touch, a feature found in iPhone 6s and later devices. 3D Touch provides you with shortcuts to things you often do on your device like send Message, emails,s and photos. To get started in using 3D Touch, open the AssistiveTouch menu, tap Custom then find 3D Touch. With a single tap, you can also use 3D Touch to give you a peek of the content you were viewing/ A second tap will give you a full view of the content. To select a 3D Touch gesture, go to Settings-> General-> Accessibility-> AssistiveTouch-> Customize Top Level Menu-> 3D TouchAction. Finally, select the action that you want to get done when using 3D Touch on the AssistiveTouch icon. How to change the text size on your iPhone 7 display? Tap Larger Text. If you prefer, you can also make the text bold or highlighted to make it easier to read. To make the text bigger, tap the Larger Accessibility Sizes to turn it on. Doing so will give you more options to configure and use on your iPhone. How to set up flash notifications on your iPhone 7? Toggle the LED Flash for Alerts switch to turn it on. How to change your iPhone 7 screen color? Select the option(s) to configure. Among your choices are color filters, invert colors, and reduce white point. Color Filters – tap this option to select different filters to color your iPhone display including greyscale. Invert Colors – tap this option to show the colors and shades on your iPhone display in the opposite way. Reduce White Point – tap this option to let you reduce the intensity of bright colors on your iPhone display. Head over to Settings-> General-> Accessibility-> TTY. Enable or turn on TTY Software. You should see the telephone icon in the status bar at the top of your iPhone display. Tap Relay Number then enter a phone number for TTY relay calls. Turn on Send Immediately if you want to send characters as you type them. Otherwise, turn it off to type full messages before sending them. Turn on Answer All Calls as TTY if you want to answer every call as TTY. Turn on Hardware TTY if you want to answer and make TTY calls from an external TTY device instead of your iPhone. Note: Voice calls won’t work if Answer All Calls as TTY is enabled on your iPhone. How use TTY on your iPhone 7? Select a contact number to call. Tap the TTY Call or TTY Relay Call icon. Key in or enter your message and then tap Send when done. How to view transcript of previous TTY calls on your iPhone 7? Tap the information (i) icon next to the call that you want view.TTY calls have telephone icon next to them. To view a transcript, tap the Outgoing Call or Incoming Call history. Connect your iPhone 7 to the computer using the supplied USB cable. Select your iPhone 7 in iTunes. Navigate to the Summary section in iTunes then click Configure Accessibility in the Options section located at the bottom of the screen. Select the feature you want to use. And that should do it! Keep posted for more iPhone 7 tutorials on our next posting.